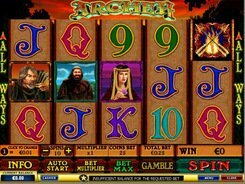 Archer slot machine is based on a legend about a brave man Robin Hood who robbed the rich and gave away the loot to the poor. 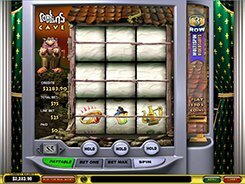 This is an “All-Ways” slot meaning it has no specific paylines in play, and its symbols can have 243 five of a kind possible combinations. So you don’t bet on each available payline. You just need to place a single bet per spin and click Spin button to start the reels. Before every round ahead, you can adjust a coin denomination from $0.01 to $5 and set 25 to 250 coins per spin. Robin Hood himself is the most sought-for symbol, with those five yielding a jackpot win of 7500 coins. The wild symbol in the slot is the Gold Coins icon. It appears on reels 2, 3 and 4 only substituting for all symbols except for the scatter (Arrow). Three scatters trigger seven free games. In the Gamble feature you have the opportunity to double up your win earned in the triggering spin if you guess correctly a color of the card, either red or black. 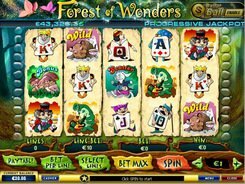 Gamble feature may continue till you reach the limit of $1000. PLAY FOR REAL MONEY!